Well getting back into my blog has not been easy I have spent hours trying to sort out template problems and not really sorted it. Blogger will not allow me to apply my own backgrounds like I did before so stuck on this layout until I have time to sort it. Anyway enough of my grumbles I do have several projects to share starting with the simple ones. Here's the card I made for the proud parents of baby Chloe. She is so tiny she certainly is a sweet pea. I have really missed posting on my blog so am really happy to get back on line. I have several projects to share. So I have started with the most simple. 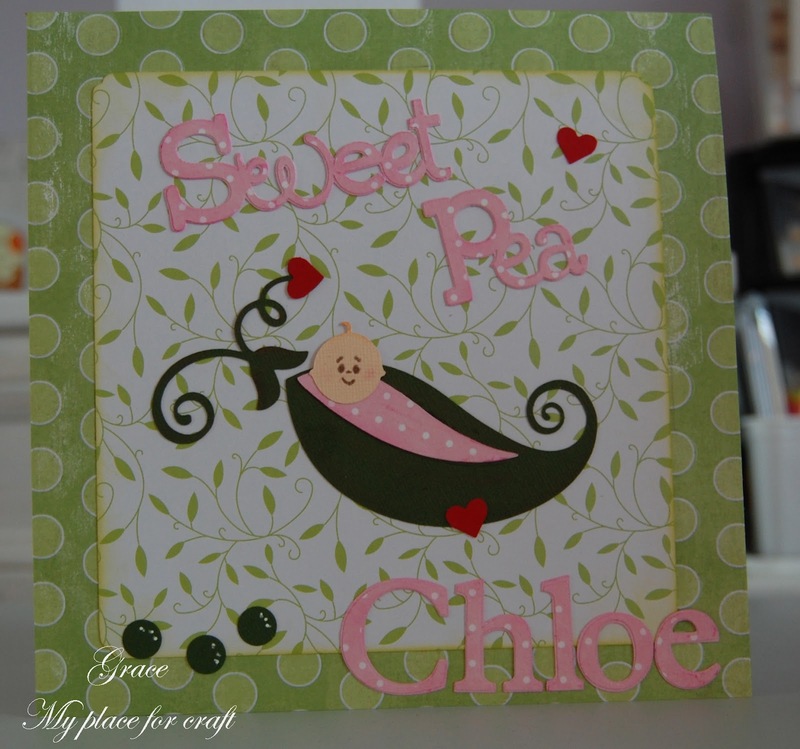 This is a card made for my brother and sister in law who have just become grandparents for the first time. Baby Chloe and her Mum will be in hospital for many weeks to come as Chloe shocked everyone by arriving early weighing in at 4lb 11oz. I had several new carts for Christmas so looking forward to using them. I haven't got to the bottom of my allergies but my face really burns when I am using the cricut mats so must be the glue. Thanks for staying by and will post more soon. My husband said I cheated with this card as it is an 8inch x 8inch already embossed. The shoes are cut using Kate's ABC cart at 3.25inches. I really love this cart. 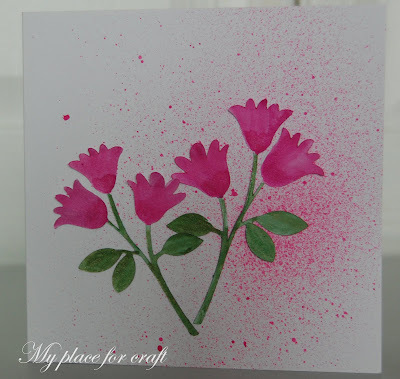 This card was very easy to make and a good step back into crafting. 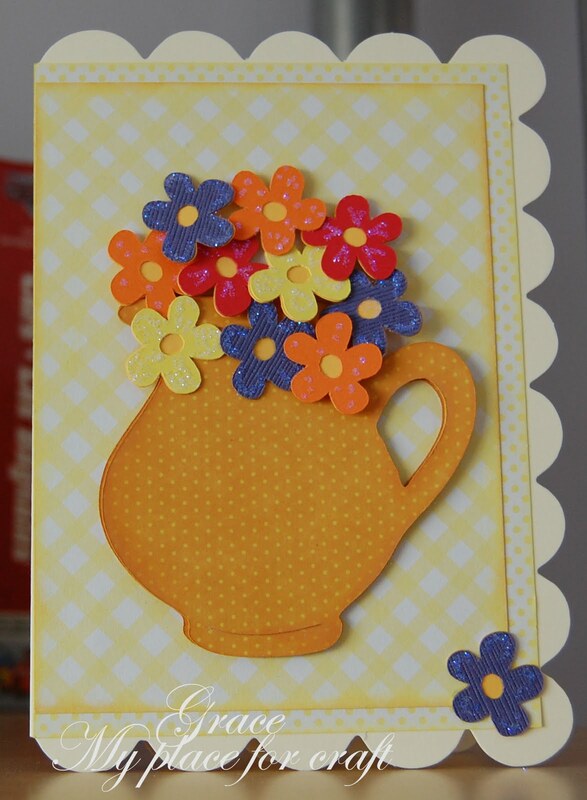 I have wanted to use this flower cut from Pooh and friends for ages. I needed a blank card that I could just add a typed letter insert. I will type my message on pink paper and maybe add some glitz. It has more sparkle than the photo shows. It’s good to be back on my blog again, I didn’t get chance to do a post before going away, thought I’d be clever and do posts while on holiday camping in the Lake District and then Chester, but I forgot to take the information I needed. (I did remember to pack the undies LOL) I also had to pack pills and potions as I have been unwell for the last 6 months with allergic reactions mostly all over my face and spreading elsewhere. So far tests have revealed I am allergic to paper, paper products, adhesives, glue, varnishes, glazes, cosmetics and a whole host of other stuff. Not bad for a paper crafter and who’s day job entails handling forms all day! A big thanks to my followers for sticking with me while I’ve not been posting much. Here are some cards I made a while ago using one of my old favourite cartridges, Walk in my garden. 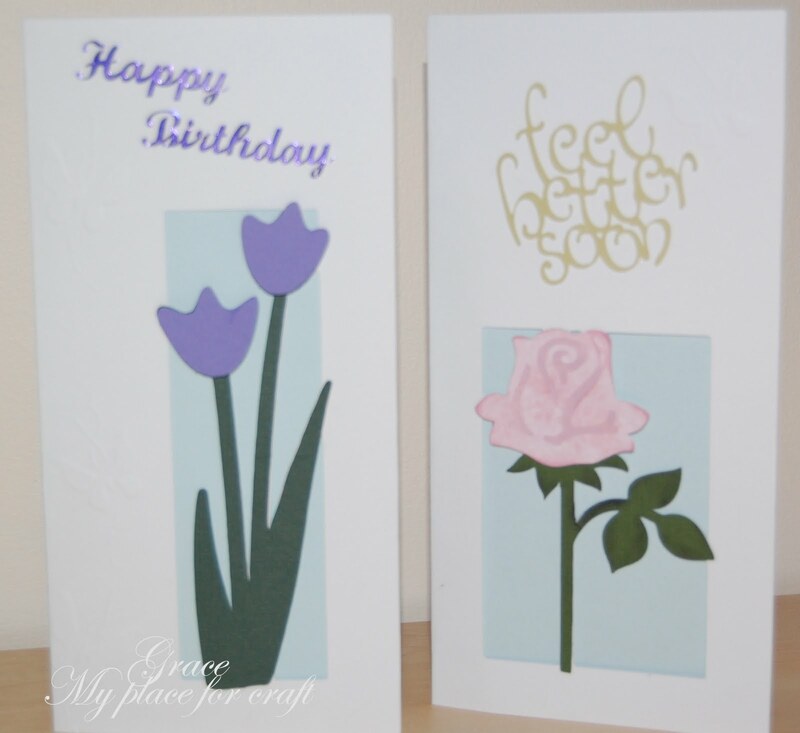 The photo’s aren’t that good but I hope to re-make some of them as they are a very versatile cut/card that can be used for all types of occasions. I have also made them adding dry enbossed butterflies which adds texture. I can't wait to get crafting again. 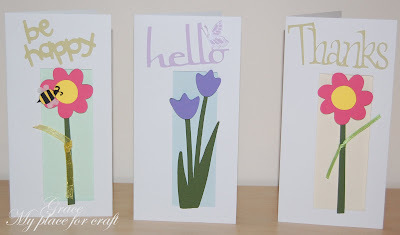 I used different coloured paper inserts which show behind the cuts. peel off used for Happy birthday. 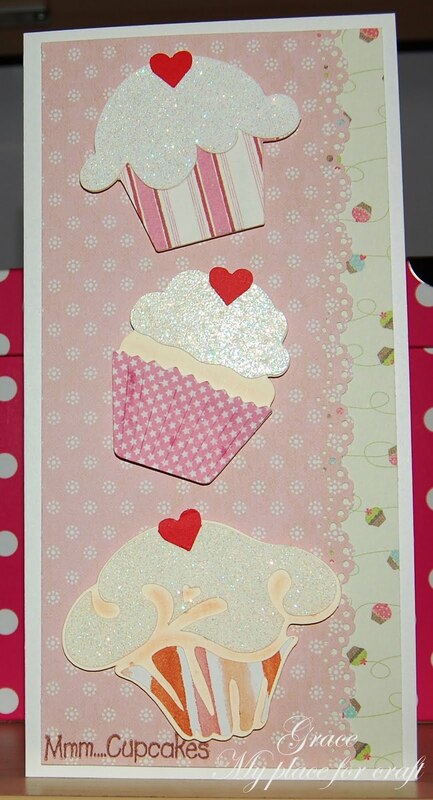 I just love cupcake cards they are fun and easy to make. Taking a photo of it however wasn't easy I just couldn't capture the depth or colours that well. Hope it doesn't make you feel too hungry. Have a happy weekend. The cake cuts came from Home decor 2.75 inches, Celebrations 2.75 inches and Doodlecharms 3.75 inches (candle cut off) Small heart punch, free stamp Mmm...cupcakes, Martha Stewart edge punch. Another easy 6 x 4 card, I needed a card with bright colours and tactile layers and was pleased with the result. I also added some glitter to give it a bit of sparkle. Life has been a bit hectic and I have not been all that well, just get over one thing and something else comes along but hopefully I can get back to my card making. It was rather funny today my 3 year old grandaughter Olivia went into my craft room and came out telling me it was very very messy, she then came and said she had tidied up my mess! When I went into the room she had indeed picked up the sorted piles I had had on the floor and put all the items on to the shelves (not so sorted now), what can I say! As grumpy as this duck is looking is as grumpy as I am feeling. My husband bought a new program for our computer and it is just causing me havoc. I am struggling to down load photo's from my camera and edit them. I daren't say how cross I am feeling, can't be published, it's a wonder the computer is still on the desk and not taken flying lessons through the window! 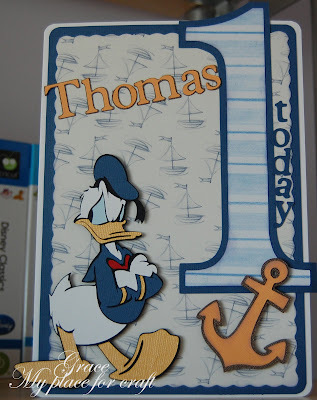 Anyway here is the card I made for our youngest grandson who was one this weekend. I wanted to do Donald as I bought him the duck when he was born. I usually do shaped cards when doing the numbers and in some ways wished I stuck to my usual style but I liked the papers. Plantin schoolbook number 1 cut at 6.5 (I think) with and without shadow Thomas 1 inch with and without shadow, today .75 inch shadow layer only. Hi I'm Grace. 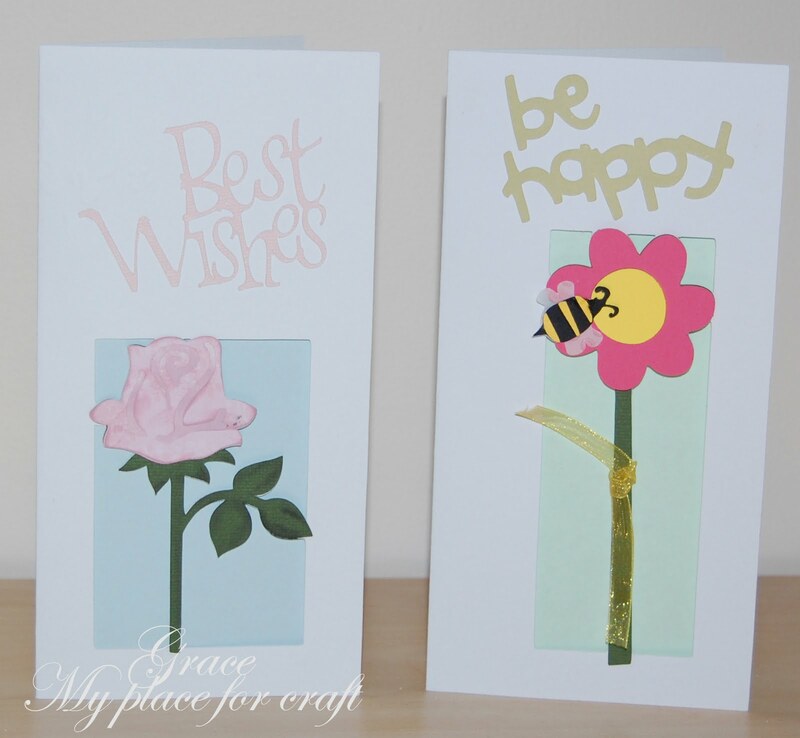 I enjoy making cards for family, friends & charity fund raising. I would like to do more scrapbooking but my craft time is limited.I have been married for 34 years (that makes me sound so old!) We have three great kids and five wonderful grandchildren. Mummy says"pretty in pink" I say "I'd rather get wet"
Thank you for visiting my place, I hope you enjoy stopping by. Feel free to scraplift any of my creations, but please give reference to my work if you do.